WASHINGTON (Reuters) – Republicans could try again to repeal Obamacare if they win enough seats in U.S. elections next month, Senate Republican Leader Mitch McConnell said on Wednesday, calling a failed 2017 push to repeal the healthcare law a "disappointment." Despite their dominance of Congress and the White House, Republicans dramatically failed last year to overturn former President Barack Obama’s signature healthcare law, known as Obamacare. 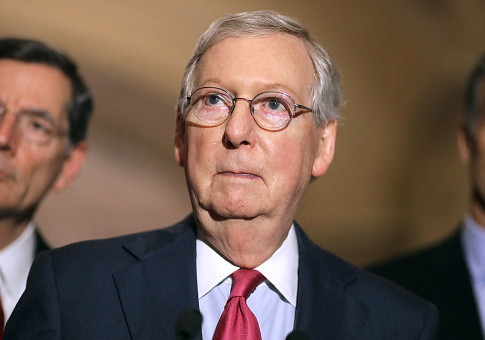 McConnell called it "the one disappointment of this Congress from a Republican point of view." He said, "If we had the votes to completely start over, we’d do it. But that depends on what happens in a couple weeks… We’re not satisfied with the way Obamacare is working." On social programs, McConnell said in an interview with Reuters: "Entitlements are the long-term drivers of the debt." Social programs that help the poor, the aged, the unemployed, veterans and the disabled are often referred to as "entitlements" in Washington. These also include Medicaid. "We all know that there will be no solution to that, short of some kind of bipartisan grand bargain that makes the very, very popular entitlement programs be in a position to be sustained. That hasn’t happened since the ‘80s," he added. "But at some point we will have to sit down on a bipartisan basis and address the long-term drivers of the debt." "We had to negotiate with the Democrats and spend more on the domestic side than I would have preferred," McConnell said. "We’ll have to sit down again and decide what we’re going to do with our annual discretionary spending after the first of the year and see what kind of agreements we can reach." This entry was posted in Uncategorized and tagged Mitch McConnell. Bookmark the permalink.